​When the evil railroad baron Clayton Boon decided to build a track to Hell, he didn’t reckon on a crazed shaman raising a posse of embittered psychopaths from the dead to stop him. ​When the evil railroad baron Clayton Boon decided to build a track to Hell, he didn’t reckon on a crazed shaman raising a posse of embittered psychopaths from the dead to stop him. Now they’ll pursue him across the whole Wild West, fighting their way through hordes of bandits, bears, braves and boogeymen just to find Boon and repay their debt with… A FISTFUL OF GUN! Select one of eleven unique playable gunslingers and seek revenge as a lone wolf or with up to eight other bandits in local and online co-op. Master the specialized controls of each character, collect gold from fallen foes to purchase upgrades, and imbibe a bit of liquid courage and unleash a tornado of lead across the dusty plains. While the indie-friendly publisher doesn't necessarily have an underlying style that unite all of its games, there is a common theme. They're all uniquely awesome in some way. A Fistful of Gun is the newcomer to Devolver, but it falls right in line as one might expect. Bullet hell in the old west, eh? Sign me up. Gunslingers with their own unique controls and powers? Even better. Crazy co-op multiplayer action? I’m sold. 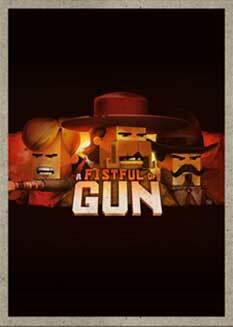 Fistful of Gun is a wild arcade-y ride that looks better in action than I could ever describe with words.